J Graham Cogley, Professor Emeritus in the Department of Geography, Trent University, Canada. Graham passed away on 4 October 2018 in Peterborough, Ontario, at the age of 70. Graham has made substantial and enduring contributions to glaciology in particular to the understanding and quantification of glacier mass change, and he is also widely recognized for his sustained and outstanding service to the wider science community and several professional organizations. After receiving his B.A. in Geography in 1969 from the University of Oxford, England, Graham emigrated to Canada and received a M.Sc. in 1971 and a PhD in 1975 from McMaster University, Hamilton, Ontario. His PhD thesis was entitled “Properties of surface runoff in the High Arctic”. He joined the faculty in geography at Trent University, Ontario, in 1975, where he spent his entire career, and was granted Emeritus Professor in 2013. Those who were privileged to work in the Arctic with Graham during his PhD research remember him as a wonderfully engaging and entertaining individual who gave generous help to novices on matters ranging from the installation of stage recorders to the calculation of rating curves and hysteresis loops. Evenings in the communal tent on Ellesmere Island were enlivened by Graham (cigarette in one hand, and a beaker of Islay Mist 8-year old malt whisky in the other) entertaining colleagues with excepts from a biography of Thomas Cranmer, tales from his student life at Oxford, or his own idiosyncratic interpretations of periglacial landforms. A memorable moment came when he gazed out of the tent window at the Sverdrup River and jumped to his feet exclaiming ‘It’s a jökulhlaup!’ and so it was: a large ice-dammed lake in the catchment was draining subglacially, and Graham led the charge to rescue the water-level recorder whilst simultaneously devising ingenious methods to reconstruct the associated flood discharge. On another occasion he stalked a lone bull musk ox to obtain a close-up photograph, little appreciating the acute danger involved in approaching solitary males. Life in the field with Graham was never dull. Graham (third from left) on Ellesmere Island as part of the McMaster University arctic hydrology research team in 1974. Left to right: Colin Ballantyne, Bruce Bennett, Graham Cogley, Ming-ko Woo, Rick Gillie and Randy Crispo. During the early years of his career Graham (together with his mentor Peter Adams) was instrumental in re-establishing the mass-balance monitoring program on White Glacier on Axel Heiberg Island which evolved into the longest mass-balance record of an alpine glacier in the Canadian Arctic. Graham’s research has been extremely broad covering a wide range topics published both in the peer-reviewed literature and numerous technical reports. 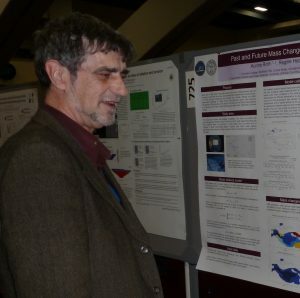 For example, his research included studies on evaporation, precipitation measurements, blowing snow, geochemistry, fluvial morphology, albedo of water, land surface schemes of General Circulation Models, continental margins, paleo-environments, image processing, direct solar radiation on inclined surfaces, map projections and determining global ocean area. Since the 1990s his research shifted increasingly towards glaciology. Above all Graham is recognized for his major contributions to the understanding of global-scale glacier mass changes. For many years he was one of very few scientists who attempted to compute global mass balances based on direct glaciological records. He developed statistical methods to extrapolate sparse data sets combining glaciological and geodetic data, and was particularly careful about quantifying uncertainties. For this purpose he compiled several widely-used global-scale datasets including an extended version of the World Glacier Inventory (WGI-XF) and GMBAL, the most complete database of direct and geodetic glacier mass balances worldwide. In tedious work, systematically screening through the literature and especially any newly published papers or reports, he constantly updated this database, making it for years even more complete than similar datasets housed at global data centers. His remarkable language skills (he spoke fluently French, Spanish and German and had advanced reading knowledge of Russian, Italian, Portuguese and Latin) allowed him to access data and literature not available in English. Graham also compiled a globally complete gridded data set of glacierized area, and developed several other global-scale data sets for further data analyses, such as global hydrographic or precipitation datasets. The glaciological datasets served as the standard for decades and have been widely used around the world. Only recently, the new Randolph Glacier Inventory (RGI), in which he also had a leading role, was compiled. His data, results and input were instrumental for the compilation of the global-scale mass-balance estimates of several assessment reports of the Intergovernmental Panel on Climate Change (IPCC). Most importantly Graham always generously shared all his data sets, responding promptly to any data requests, and providing exceptional user support. Graham has also provided exceptional service to the glaciological community in numerous other ways. Since May 2016 Graham has served as Chief Editor of the Journal of Glaciology and Annals of Glaciology, which also included ex-officio functions for the IGS Council and its publications committee. He was chief editor of the 2016 Annals of Glaciology volume on “Glaciology in High Mountain Asia” and associate editor of several other Annals volumes in addition to earlier editorships with other journals. Another example is his outstanding contribution in his leading role in the Working Group on Mass-balance Terminology and Methods‘ (2008-2012) of the International Association of Cryospheric Sciences (IACS) in compiling a “Glossary of mass balance and related terms“. He skilfully led an international team of Working Group members over three years to produce the comprehensive >100 page consensus glossary. The high quality product is largely due to his remarkable commitment, dedication, and attention to details, combined with his superb leadership and diplomatic skills. He then went on to co-chair IACS’s Working Group on the Randolph Glacier Inventory (RGI) and infrastructure for glacier monitoring (2014-2018) which released several updated RGI versions. Graham single-handedly did all the technical work to include any new glacier outlines into the RGI. Also here his care for details and accuracy was remarkable. No matter how small a glacier may have been and how much work it entailed, he made sure it was properly implemented into the next RGI update. He also served as member of the advisory board of the Global Terrestrial Network for Glaciers (GTN-G) since its start in 2011 providing valuable input to global glacier monitoring. Graham contributed significantly to several IPCC reports both as lead and contributing author, as well as to other international and national science assessments. He was instrumental in detecting and tracing the source of the notorious false claim in the IPCC Fourth Assessment Report on rapidly disappearing glaciers in the Himalayas. Graham was also regularly invited to provide commentaries, for example, for high-profile journals on newly published studies; he also frequently explained glaciological matters to the public through newspapers, interviews or blogs. He performed an astounding number of reviews (dozens per year) for many different journals. His reviews were always remarkably thorough, detailed, constructive and of high quality. Highly deserving, he was twice acknowledged for “Excellence in Refereeing“ by Geophysical Research Letters. Graham did not travel much to conferences or similar events especially in recent years, but he was well connected with the glaciological community from his study room in his home in Peterborough where he lived with his wife Kathie and their cat (which enjoyed the privilege of being allowed to sit on his keyboard as he typed). Graham actively collaborated in projects, co-authored papers, served in various international service functions, updated his databases, reviewed papers and proposals and responded to the daily flood of requests and questions from around the world until shortly before his passing despite struggling with chemotherapies, seemingly working tirelessly day and night. At times many of us wondered: “Does he ever sleep?” given his almost instantaneous email responses no matter which time zone they came from. Graham’s contributions were widely sought and highly regarded not only because of his broad scientific expertise, insight, dedication and fastidious attention to detail, but also because of his extraordinary collegiality, kindness, modesty and patience combined with a good sense of humor, tirelessly supporting scientists and students around the world and selflessly sharing data and knowledge. He has had a tremendous impact on generations of glaciologists and the field of glaciology at large. Graham will greatly be missed as a scientist, colleague, collaborator, mentor, and friend, but his legacy and spirit will live on.